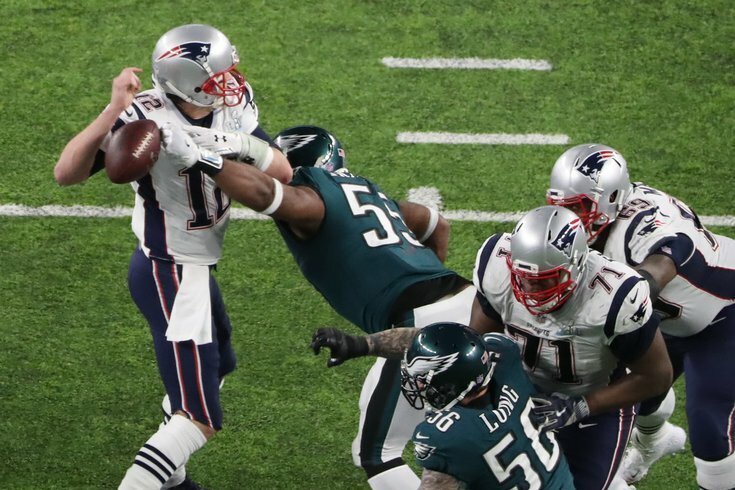 Brandon Graham is a Super Bowl hero. Ever since the Philadelphia Eagles selected defensive end Brandon Graham with the 13th overall pick in the 2010 NFL Draft, he has heard a lot of crap about not being as good as Seattle Seahawks safety Earl Thomas and New York Giants defensive end Jason Pierre-Paul, who were both drafted after Graham that day. Thomas, for example, became a six-time Pro Bowl safety, five-time First Team All-Pro, and a Super Bowl champion. To shield himself from the criticism, Graham went on Twitter blocking rampage. If you wanted to follow him on Twitter (@brandongraham55), there was a pretty good bet you were already blocked. Graham has since made himself into a great starter, adept at creating pressure in the passing game, and playing exceptionally well against the run. He is one of the best defensive ends in the NFL. As you all saw, in the Super Bowl, Graham made the game-sealing play in the game when he strip-sacked Tom Brady, with the fumble being recovered by Derek Barnett. He is a Super Bowl hero, and a Philly legend, for life. A few months ago, I brokered a deal with Graham that if the Eagles won the Super Bowl, he would unblock everyone that he blocked previously on Twitter. Graham was true to his word. I went into his account and literally just unblocked everybody. You are all now unblocked. If you'd like to follow Brandon once again, you may do so here.